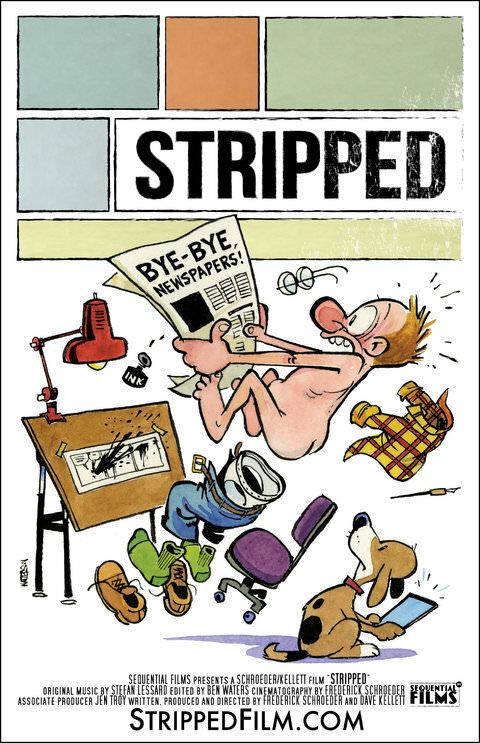 Filmmakers Dave Kellett and Fred Schroeder considered themselves extremely lucky to land an on-camera interview with famously elusive, if not quite reclusive, Calvin and Hobbes creator, Bill Watterson (PeekYou profile here), for their new documentary, Stripped; a film about the art of the newspaper comic strip. Upon seeing the finished movie, the lamentably retired-from-cartooning Watterson was apparently so pleased that he offered to draw the movie’s poster. The result is included above. In the years since, Watterson is said to have taken up painting, and has — for the most part — steered clear of the public eye. Any piece of new cartooning from him, at this date, is simply a big deal; even if only symbolically. Accordingly, the Internet is buzzing.